Your base will be Aegialis Hotel & Spa with 50 rooms and suites all with balcony or terrace overlooking the spectacular bay of Aegialis. The Double or Twin Superior Rooms all have en-suite facilities and all have airconditioning, flat-screen tv’s and WIFI. Guests of the hotel can make free use of the spa facilities (sauna, hammam, Jacuzzi, indoor and outdoor seawater swimming pools and gym). All meals that are served are prepared with organic vegetables, grown in the hotel’s own garden. Vegan and vegetarian meals are also available. The holiday is offered on half-board basis; you can choose between lunch or dinner. Breakfast is American – Amorgian with a great variety of local specialties. Dinner consists of 5 courses served, or in buffet with a huge variety of local dishes. Both guided and self-guided walks are offered during this holiday. During the guided walks, visitors can meet local farmers in agriculture and shepherds with goats in stock-farms and stables from natural stone, and visit archaeological sites, monuments and remnants of medieval period as well as wind mills, threshing circles, well complexes, chapels, cisterns, bridges, small gorges, rock carvings. Walk on old donkey paths next to valleys, huge cliffs and rocks. Sweet smells from herbs (sage, oregano, flaskomilo, etc) and wildflowers fill the air and will accompany you during your walks. Enjoy the unique landscape and flora along the spine of the island and the breathtaking view to the ‘Big Blue’ of the Aegean; the small eastern Cyclades and Naxos Island. It also possible to add guided walks to your holiday, at a cost of €80 for walks of up to 4 hours and €150 for walks of 6-9 hours. This holiday is also highly suitable for groups that would like to do a guided itinerary. 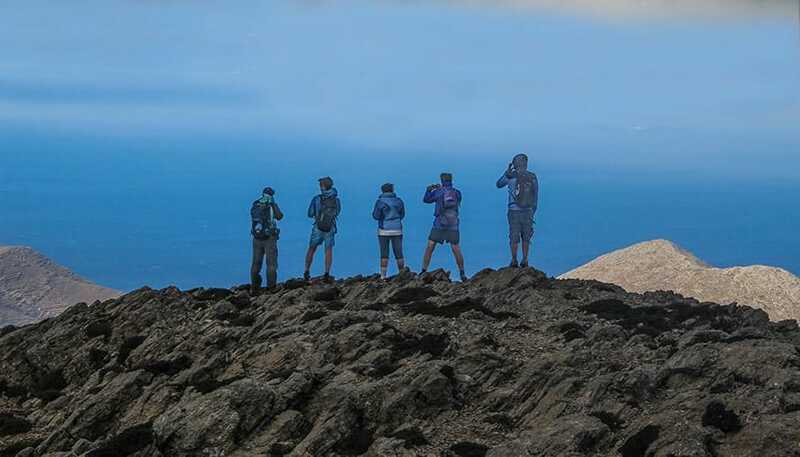 This example itinerary includes 3 self-guided and 3 guided walking days. Please note that it also possible to do more guided walks at an additional cost, or only do self-guided walks which makes the holiday cheaper. Please contact the holiday provider, through the contact form, for more information on other itineraries. Day 1 – Arrival to Amorgos Island. Transfer to Aegialis Hotel & Spa. Welcome drinks. Overnight. Day 2 – Self-guided walking day. Breakfast. Introductory meeting with Aegialis Hotel & Spa manager. Transfer to Tholaria village to walk through the path to Lagada village. 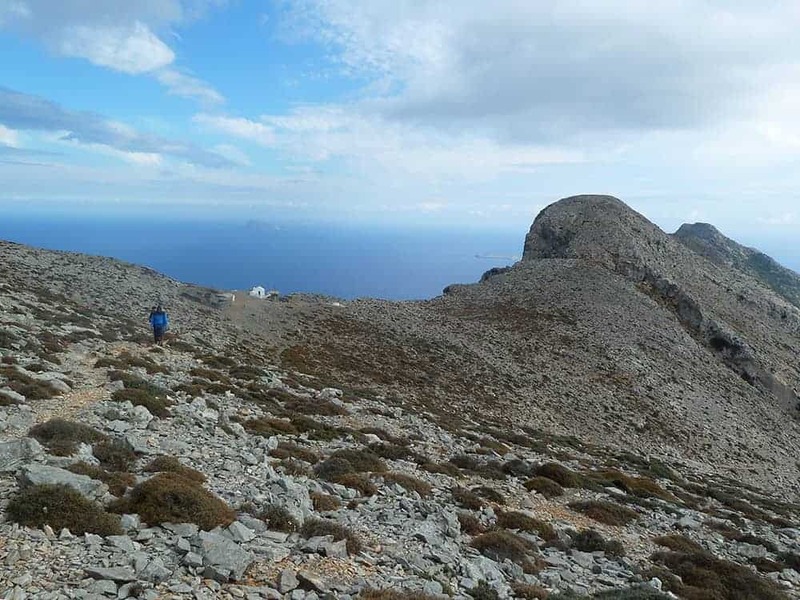 This hike is one of the most beautiful on Amorgos. 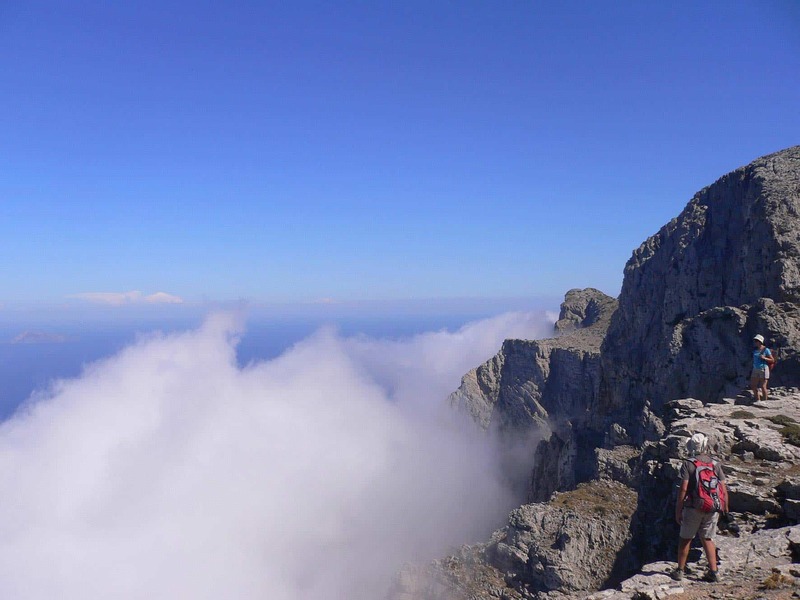 The whole route involves magnificent ancient trails through the pales above Aegiali port. Rest and walk to Ormos by the old path through the olive grows. Pick up from Ormos to the hotel. For something easier, instead of walking from Tholaria to Lagada, walk to the port of Aegiali and the beaches of Aegiali and Levrossos. Day 3 – Self-guided walking day. Breakfast. Transfer to the Monastery of Virgin Mary Hozoviotissa. After visiting, walking through the old path, to Aegiali. This is a 4 hour walk. For those who like to walk less, the bus will wait for them by the Monastery, so after their visit they will be transferred to Asfodilitis, half way to Aegiali, to start walking from there. Pick up from Ormos in the afternoon. Day 4 – Guided walking day. Breakfast. Transfer to Chora. See the village with the 40 churches, the Venetian castle and the Archeological museum. Walk to Katapola, through the old path. There is possibility to walk to Peristeries, towards the nice beach of Agios Panteleimon. Pick up in the afternoon from Katapola. Day 5 – Guided walking day. Breakfast. 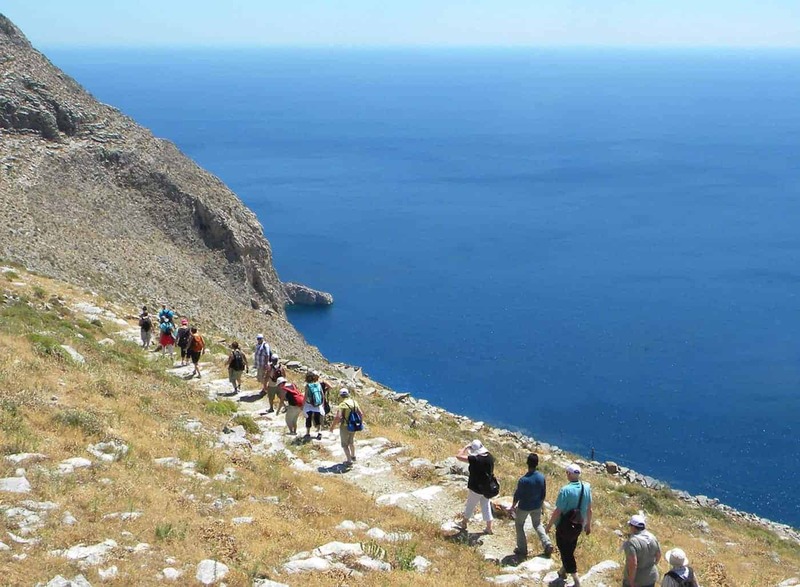 Transfer to Lagada village to start walking to the Windmills and following to the church of Stavros. Head to the church of Agios Theologos and the church of Virgin Mary Epanohoriani. Pick up in the afternoon from Lagada village. Day 6 – Guided walking day. Breakfast. Transfer to Kamari in South Amorgos. Visit the ancient site of Arkesini, the Hellenistic Tower of Agia Triada, Vroutsi village and walk through St. George Valsamitis and Minoa to Katapola. Pick up from Katapola. Day 7 – Self-guided walking day. Breakfast. Transfer to Tholaria village, walk to St. John-Akrotiri through the old path with a spring used for gardens and animals. Return to the hotel through the beaches of Psili Ammos and Levrossos. Dinner and Greek night. Day 8 – Early breakfast. Departure to Piraeus port. Supplement for single occupancy of a hotel room is €165.